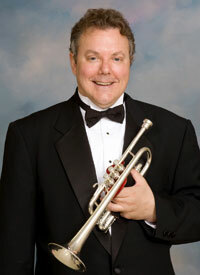 Kevin Davis is in his 26th season as principal trumpet with the Kishwaukee Symphony Orchestgra. He is originally from the Detroit area where he studied with Jim Underwood (Michigan Lyric Opera, Columbus Symphony), Louis LaRose (Detroit Symphony), and John Smith. Kevin earned a B.S. in Music Education at Oakland University. During his years in the Detroit area, he performed with the Macomb Symphony, the Pontiac-Oakland Symphony, the Rochester Symphony, the Warren Symphony, the Oakland University Concert Band, and the Oakland Brass Quintet (founder), and toured with the Meadowbrook Estate Show Choir. While in Illinois, he studied briefly with Arnold Jacobs (Chicago Symphony) and performed with the Rockford Symphony Orchestra, the Glenview Symphony, the DeKalb Municipal Band, the First Free Church Orchestra in Rockford, and various productions at Starlight Theatre in Rockford. Kevin holds an inactive license as an Illinois educator. Kevin owns the project studio Musikd.com, original music for original people® (www.musikd.com), which provided the KSO with mastered archival recordings of performances at no cost to the orchestra 2004-2013, including the recordings used by the Illinois Council of Orchestras to name the KSO the 2009 Community Orchestra of the Year. Musikd.com also produced the Pascere Benefit concert 2000-2006, the albums White English Rain, and Interludes (available on iTunes®), and mastered various recordings for local musicians. In addition to his musical activity, Kevin completed the Jungian Psychotherapy program at the C.G. Jung Institute in Chicago and earned an M.A. in counseling psychology at Pacifica Graduate Institute in California. He is licensed as a Marriage and Family Therapist (active limited educational license) in Michigan and has traveled extensively to Europe, Asia, and South America. All of these experiences inform his performances, which he hopes will enrich your life. His master’s thesis, “Manifesting archetypal energy through music,” is a performance thesis that explores the intersection of music and depth psychology and was used a model thesis at Pacifica Graduate Institute for several years; it is available as a free download at Proquest. It is of interest and useful to psychotherapists, musicians, educators ,and the general public.